The architectural firm, Hellmuth, Obata + Kassabaum (HOK), has announced the LEED® certification of one of its projects—-the new Delta Air Lines’ Terminal A at Logan International Airport in Boston, MA. The certification marks the world’s first air terminal to earn LEED® status from the U.S. Green Building Council (USGBC). The facility maximizes sustainable building methods and technologies, overcoming the significant obstacles inherent in bringing “green” design to airports. To combat the accelerated heat island effect and stormwater runoff issues typically caused by impervious surfaces on runways, parking lots and large roofs areas, for example, Terminal A features a roofing membrane and paving designed to reflect heat from the building and special stormwater filtration devices to remove suspended solids and total phosphorous. Some of the project’s other sustainable strategies include: water-efficient plumbing and irrigation; extensive daylighting and high-insulation glass; energy-efficient electric lighting; construction waste recycling; and the use of recycled, local materials. These approaches take on particular significance when considering the large scale of the facility, which encompasses more than 640,000 square feet. With 10% of all materials on the job coming from recycled sources and 75% of construction waste being reused, recycled or otherwise diverted from area landfills, the project has saved many thousands of tons of raw materials. Terminal A is comprised of two structures: a 362,000-square-foot main terminal and a 284,000-square-foot satellite concourse, connected by an underground pedestrian moving walkway. The distinctive and contemporary HOK design clearly reflects the vision that has guided the Logan modernization program. Designed to be a national model for passenger friendly and environmentally responsible airport facilities, the terminal pays particular attention to indoor environmental quality. 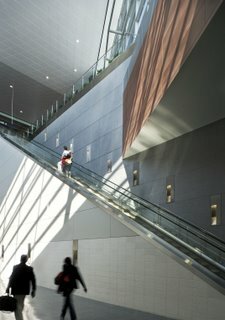 Daylight is a primary focus of the terminal’s design, striking a careful balance between the benefits of exterior light and undesirable glare. Special measures were taken to control construction contaminates from adversely affecting the indoor environment. Adhesives, sealants, paints and carpets were specified to have very limited or no volatile organic compounds. The terminal also integrates the latest government-mandated screening systems, with 100% of outbound baggage screened and a single central passenger security checkpoint to reinforce clarity in passenger movement and to optimize security procedures. C&R/Rizvi, Inc., located in Boston, was associate architect on the project.